FINALLY! In the past couple of weeks the sun has started to shine. Yippee! 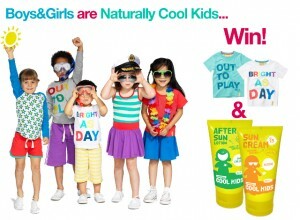 So Boys&Girls have got together with their friends at Naturally Cool Kids to bring you a little competition in celebration. Naturally Cool Kids make brilliant toiletries for kids using only natural and organic ingredients and all produced in the UK. One lucky winner will be picked at random on Friday 9 May evening. This entry was posted in General, Win.